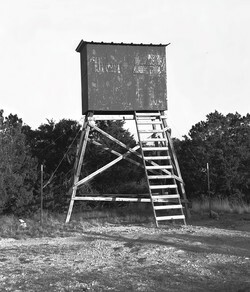 The photo "Deer Blind," taken by SFA student John Allen, is among the works selected for the Pineywoods Photography Exhibition showing Nov. 14 through Dec. 12 in Griffith Gallery on the SFA campus. NACOGDOCHES, Texas - The Stephen F. Austin State University Photo Club will host its first juried show of student work, the Pineywoods Photography Exhibition, Nov. 14 through Dec. 12 in Griffith Gallery on the SFA campus. Juror Priya Kambli selected work for the exhibit from more than 75 submissions sent in by students from across the SFA campus. Three awards will be announced during the opening reception, which is scheduled for 5 to 7 p.m. Wednesday, Nov. 14, in the gallery. Kambli is a photographer and artist whose work has been shown nationally and internationally. Her work is featured in the exhibition "Priya Kambli: Color Falls Down," which shows in Griffith Gallery through Nov. 8. Born in India, Kambli emigrated to the U.S. at the age of 18 and often makes work informed by that experience. She completed her Bachelor of Fine Arts degree at the University of Louisiana in Lafayette and received a masters degree in photography from the University of Houston. She is currently professor of art at Truman State University in Kirksville, Missouri. In 2008, PhotoLucida awarded her a book publication prize for her project "Color Falls Down," published in 2010. Griffith Gallery is located in the Griffith Fine Arts Building, 2222 Alumni Drive. The SFA Photo Club is a student organization open to all students interested in photography. Group members plan events and activities throughout the year, including workshops, field trips and exhibits. For more information, follow them on Instagram at @sfasuphotoclub or email sfaphotoclub@gmail.com.